Now three months after the Roadshow, we have gathered feedback from schools and are really excited to share with you some of the comments we recieved. "I think their opinion of the application process changed as it was demystified for them"
"Meeting the ambassadors was really useful for them to see that they were 'ordinary' young people"
"I think the presentation dispelled some outdated stereotypical impressions of what Oxford students are like and what the university is looking for in its applicants"
"The pupils felt that the students were approachable, and I felt that they did an excellent job of selling Oxford as both an aspirational and achievable goal"
The (example) interview questions were very interesting and the students felt proud to have been able to give responses to them"
"The pupils were very positive and felt more informed"
"The example of interview questions (was) very useful - in particular it engaged one of the less attentive boys in the audience who was evidently keen to discuss the question posed, despite perhaps considering himself "too cool for school"!" The Roadshow was a great success, and once again we'd like to say thank you to everyone who supported us. Thank you so much to everyone who has donated so far - we are now 54% funded and are just over £400 from our target! Please share the link if you can, so that we can tell even more people about our project and access work here at Somerville. Thank you all so much on behalf of the whole student ambassador team, we're all very excited! We'd like to give a huge thank you to everyone who has donated so far - we've currently raised £635 (a fantastic 31% of our target!). 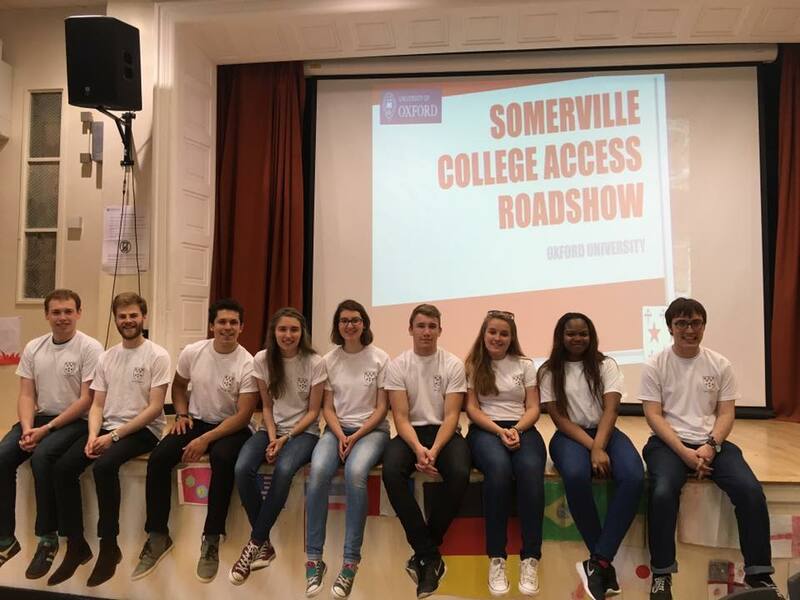 Please keep sharing the link and spreading the word about our project, and remember to 'like' our Facebook page to keep up to date with the Roadshow and all the other Access/Outreach work happening at Somerville. Thank you again!